own in-built speaker, along with a cheap microphone. 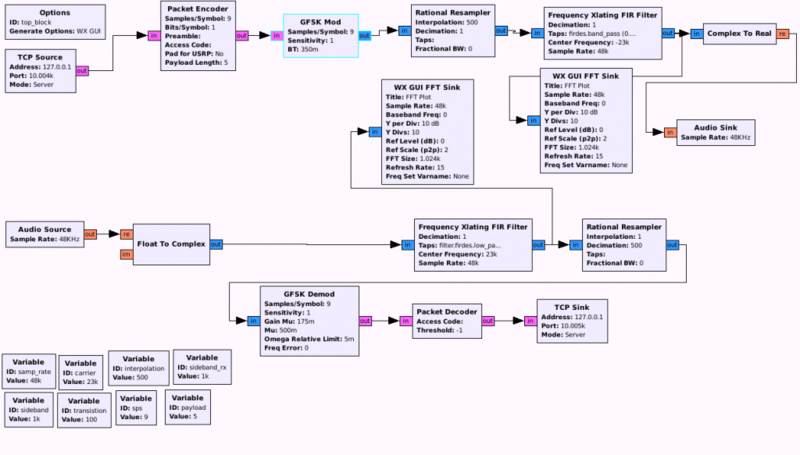 Gnuradio is an excellent suite of programs, which allows the creation of Software Defined Radios. We make use of the packet encoder/decoder modules, in order to handle all good stuff like correctly aligning bits to the byte boundary etc. One very important setting you must do is to make sure the gain of the final output, is around 0.5, as if not set to around this, you will get audible output. I’m looking to modify the generated python code, to automatically iterate through a wide range of different potential baud rates and different modulators, in order to find the most effective configuration to use. Nice. It would be interresting to know how 23kHz is efficient under water. Hi, what version of gnuradio did u use ? Hi, which daughterboard did you use in this project? I’m just using the computers soundcard. Hi, what is the maximum distance between the laptop? I’ve only tested to around 3m so far. hi, i’ve tried gnuradio-companion file, but the wx gui is not showing up? do you know shy? i’m using gnu radio companion 3.7.2.1.
whether it has the effect of warning? I’m using 3.7.2.1 too, which works fine for me, possibly you haven’t compiled it with WX support? But when i tried to run a simple grc the wxpy was run very well, i tried to change the tcp sink with audio sink or null sink, your ultrasound-fsk wx gui is showing up. I want to try, create ultrasonic like your grc project. i have a question for to ensure me, can we create ultrasonic with frequency more than 23 khz (maybe more than 30khz) using standard speaker (that written have spec: respond in 90 hz – 20 khz)? only seem to go up to around 48kHz, meaning the max. frequency you could output would be 48/2=24kHz (according to nyquist). Hi, I’m trying to test your project, but I have some doubts about how to adapt it using GRC under Win7. Must I to run two instances in 2 laptops with different TCP addresses? Must I setup some parameters for audio soundcards? to join the #gnuradio IRC channel on freenode for some good advice. I would like to know if you tested it in a closed environment like a steel pipe. I have project and it would be very helpfull if you test it inside a steel tube. I can’t see why it couldn’t work, could you expand more about your project though, sounds very interesting. I’m interesting in ultrasound voice transmission. the idea is, transmitter device modulate the voice to 20khz ~ 24khz and play it through speaker, then the recevier device catch it and demodulate the sound and play it. the theory is make sense i think, but i’m not sure it really works well. the quick and best way is just code the program and run. but i wonder it can be. do you think my idea is make sense? and does it work you think? I tried running the same project but it keeps on telling me that the makefile can’t be created and it doesn’t offer me the input screen to enter the required text to be transmitted. After creating the flowchart using Gnuradio, do I have to write another python code for the capturing screen or it suppose to be generate when I run the flowchart. Without further information on what it says, I’m not sure I can help I’m afraid. also not really sure how i use the TCP source but ill look into that. do you know how i could use a file source instead and send a text file or something. anyway ill continue my search, thanks very much for the project file im sure it will be a huge help once i get it working! Hi, it looks like you may already have something running on that socket? could u kindly correct this error. its getting the same error in both client and server laptop as i setted. Hi, and am adding up another issue in this project. That is am using GNUradio 3.7.5. Is it necessary to use only 3.7.2 for this better execution. And another doubt is in both the laptop(as client and server) the addr we are giving is 127.0.0.1 so is it possible to communicate both the machine, as far as i have installed GNUradio in VMware(Ubuntu) and in another machine as Main booting OS as ubuntu… Kindly clear my doubts. I’ve not tested it in the latest GNUradio, but it should work, as far as I know. I’m not sure exactly what you mean with respect to VMware. Am using Ubuntu in VIrutal machine, in that am using GNUrado 3.7.5 but its getting error..
Hi, what window are you using to input and display the message? I tried searching under the x windows but am not getting any luck. Thanks! If I recall correctly, it was just a terminal, running netcat, to connect to the TCP server. Thanks! Is it possible to run both on one laptop using two terminals? hi, i would like to know which version of ubuntu you have used for GNUradio for this project. i have tried with ubuntu 14.04 version but its not working for me..
showing error as volk machine running.